Stability is a measure of the atmosphere's tendency to resist vertical motion. Unstable conditions are required for hazardous weather including thunderstorms. Stability can be determined by measuring the ambient lapse rate. Wind shear is an atmospheric condition that may be associated with a low-level temperature inversion, a jet stream, or a frontal zone. Wind shear occurs with either a wind shift or a wind speed gradient at any level in the atmosphere. 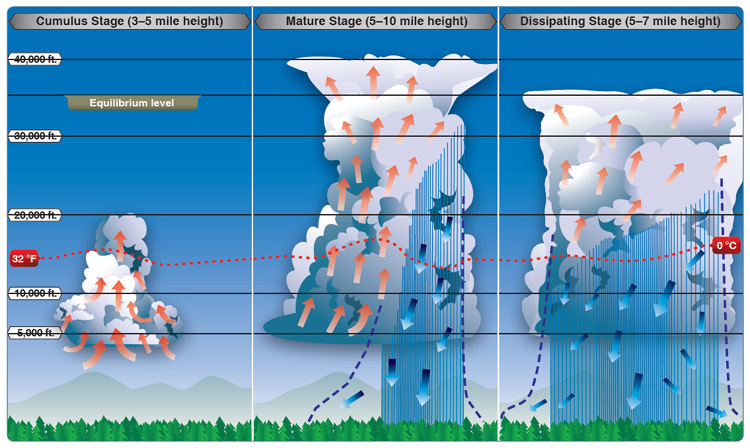 Hazardous wind shear is commonly encountered near the ground during periods of strong temperature inversion and near thunderstorms. Wind shear may found on all sides of a thunderstorm cell as well as directly underneath it. "Wind Shear - A change in wind speed and/or wind direction in a short distance resulting in a tearing or shearing effect. It can exist in a horizontal or vertical direction and occasionally in both." "Wind shear is a sudden, drastic change in wind speed and/or direction over a very small area. Wind shear can subject an aircraft to violent updrafts and downdrafts, as well as abrupt changes to the horizontal movement of the aircraft. While wind shear can occur at any altitude, low-level wind shear is especially hazardous due to the proximity of an aircraft to the ground. Low-level wind shear is commonly associated with passing frontal systems, thunderstorms, temperature inversions, and strong upper level winds (greater than 25 knots)." "Wind shear is the rate of change in wind direction and/or speed per unit distance. Wind shear generates turbulence between two wind currents of different directions and/or speeds. Wind shear may be associated with either a wind shift or a wind speed gradient at any level in the atmosphere." Airborne weather-avoidance radar provides no assurance of avoiding instrument weather conditions. A pilot reporting turbulence that momentarily causes slight, erratic changes in altitude and/or attitude should report it as light turbulence. 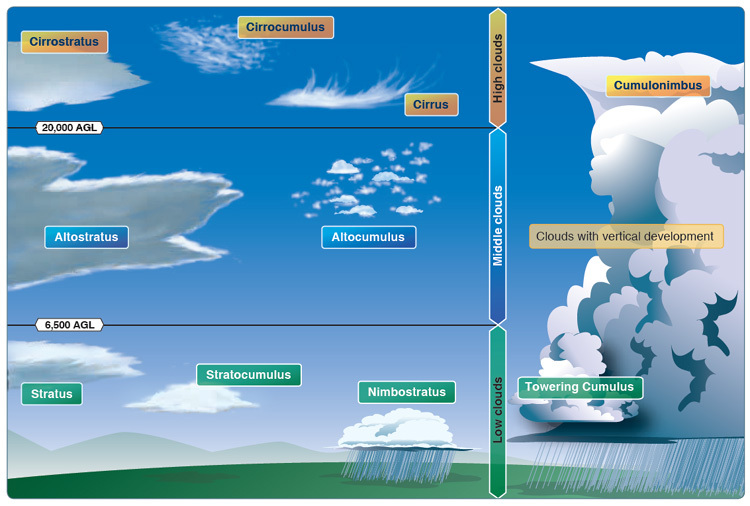 Clouds are divided into four families: low, middle, high, and clouds with extensive vertical development. Orographic lift occurs when an air mass is forced upward as it moves over rising terrain. As the air mass gains altitude it quickly cools down adiabatically, which can raise the relative humidity to 100% and create clouds and, under the right conditions, precipitation. The cloud's type or structure is dependent on the stability of the air before lifting occurs. Fair weather cumulus clouds often indicate turbulence at and below the cloud level. Clouds with extensive vertical development can be expected when an unstable airmass is forced to ascend a mountain slope. Standing lenticular clouds in mountainous areas indicate turbulence. Cumulonimbus clouds are associated with the greatest turbulence. High clouds are composed mainly of ice crystals and are least likely to result in structural icing. "Nimbus" is the Latin word for "rainstorm/cloud". Nimbus clouds are associated with rain. Requirements for the formation of a thunderstorm are sufficient moisture, an unstable lapse rate, and a lifting action. The cumulous stage of a thunderstorm is characterized primarily by updrafts. A thunderstorm has entered the mature stage when downdrafts have developed and precipitation begins to fall. Upward currents enhance the growth rate of precipitation. The dissipating stage is characterized primarily by downdrafts. If a pilot unintentionally enters embedded thunderstorm activity he should set power for recommended turbulence penetration airspeed and attempt to maintain a level flight attitude. Aircraft are most likely to be struck by lightning when the outside air temperature (OAT) is ±5°C. Squall line thunderstorms generally produce the most severe conditions, such as heavy hail and destructive winds. If squalls are reported at your destination you should expect sudden increases in wind speed of at least 16 knots lasting for approximately one minute. Shower and thunderstorm cells sometimes produce intense downdrafts called downbursts that create strong, often damaging winds. Downbursts can create hazardous conditions for pilots and have been responsible for many low-level wind shear accidents. Smaller, shorter-lived downbursts are called microbursts. Maximum downdrafts in a microburst encounter may be as strong as 6,000 feet per minute. Individual microbursts rarely last longer than 15 minutes.